This summer, my Israeli-born boyfriend convinced me to take advantage of incredibly low ticket prices to visit Israel. Though it’s not as if I’m terribly hard to convince when a trip anywhere at anytime is proposed. So to escape terrible winter temperatures we went to beautiful, vibrant and ever so sunny Israel. But aside from tons and tons of sunshine and historical and religiously significant sites, Israel has a very vibrant culinary culture. A fusion of eastern european traditions brought by Jewish immigrants as well as middle eastern traditions inherent to it’s location, meals in Israel are beautiful mixture that had my belly overly satisfied the whole time we were there. I stuffed myself silly on hummus with all the toppings, finished off every meal with some sweet and moist rugelach dessert, and made frequent pit stops at fresh pomegranate juice squeezing stations. A starvation diet will follow arrival back in the States, I reassured myself during our short breaks between meals. When I came home my family had a bet going on how many of my pictures from our trip would be of food. My brother won- 53 out of 213. Israelis are just so damn good at the whole sit around the table and eat thing. Here are excerpts from my field notes. Hands down this is the absolute best part of the eating in Israel experience. You sit down at a restaurant, you’ve barely had time to ask for an English menu and then it happens. Your table gets completely packed with small plates of appetizers. Hummus, baba ghanouj, falafel, tahina (known as tahini around these parts), tabouli, chopped vegetable salad, olives, and some sort of a couscous fresh vegetable combination. All this accompanied by fresh out of the oven Laffa bread (which is like pita but thinner and larger). The sharing that accompanies this is such a joy. You rip the Laffa with your tablemates and start the sharing and talking. I like tables with no boundaries, without any my-plate-your-plate business. It’s so communal and just flat out fun. And lest we forget the food, my attempt to qualify it with words would be a disservice. This is a great little trick with a bit of background- kosher rules prohibit the use of meat and milk products in one meal. But meat dishes still need an added creaminess, an added bit of sauce and flavor. Enter tahina. A paste/sauce made from ground, hulled sesame seeds. With a lovely creamy texture and a light, pleasant flavor it’s the perfect accompaniment to every single meal. It’s also a key ingredient in many middle eastern dishes. Since the trip, I’ve really started including tahina in my meals- it makes a lovely salad dressing: I usually mix it with a little avocado/olive/grapeseed oil and add a little salt and chili. This was a huge revelation for me. 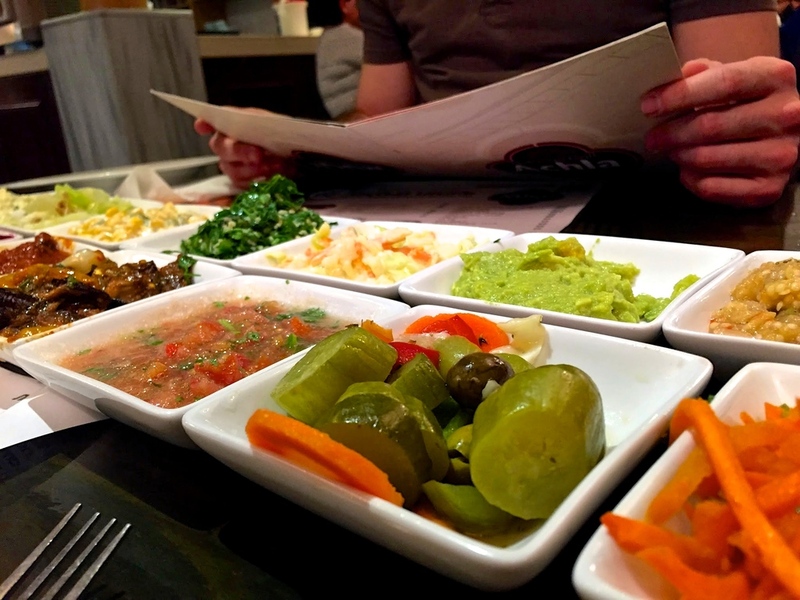 Sometimes (or often) Israelis eat hummus as a free-standing meal. And I was also informed that it’s a wonderful hangover cure as well. But the hummus isn’t simply hummus, it’s topped with any combination of whole chickpeas, parsley, cayenne pepper, ground cumin and drizzled with olive oil. But the best part? You eat it with onion. Yes, a whole yellow onion is cut into quarters and you dip the onion, alongside the warm pita, in the hummus. I’m going to be very honest, since coming home from the trip I’ve frequently looked back on the picture below just to admire its beauty and pure genius. A classic Israeli breakfast food, Shakshouka originated in Tunisia and was brought to Israel by Tunisian Jewish immigrants. It’s a one skillet recipe of sunny side up (or poached) eggs baked on top of a tomato, onion and red pepper sauce spiced with cumin, paprika and cayenne pepper. It’s so easy to make- just mix all the fixings in a skillet: stuff like grapeseed oil, garlic, onions, maybe a jalapeno for an added kick. Spice with cumin, paprika, cayenne pepper and the like. Add a bit of water. Simmer for about 15 minutes. Then crack the eggs on top and cover till eggs are ready to be consumed. Eggplants are delicious, and eggs make everything more delicious. So why not combine the two in a pita and make it a party? 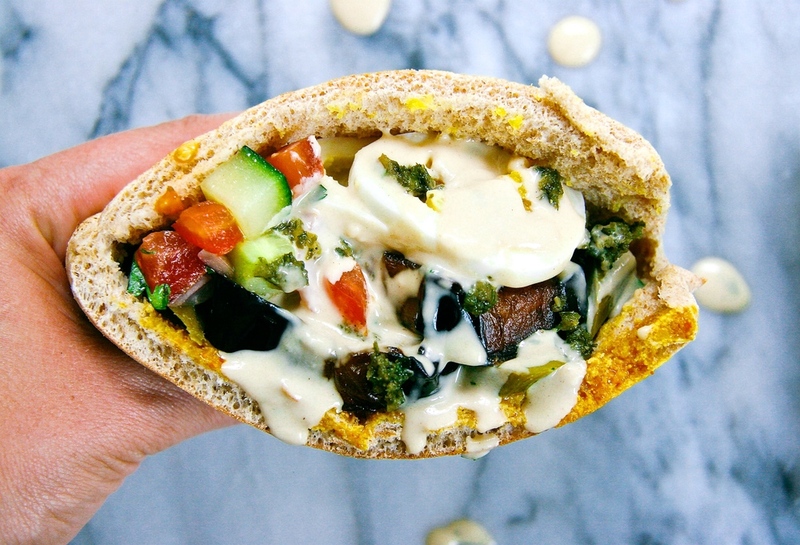 Sabich is a traditional Israeli sandwich which was brought to the country by Iraqi Jewish immigrants who had a tradition of eating it on Saturday mornings. Just fill a pita with fried eggplant, hardboiled eggs, hummus, tahina (told you so), chopped veggies and parsley. Enjoy and stay warm; till next time!